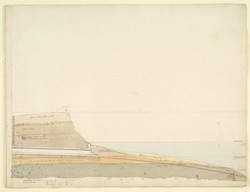 Pen and ink and water-colour plan showing a cross-section of the River Ganges by James Prinsep (1799-1840) between 1822 and 1829. James Prinsep was the seventh son of a Calcutta merchant, John Prinsep. He took up a position as Assistant Assay Master at the Calcutta Mint in 1819 before spending 10 years in Benares as the East India Company’s Assay Master (1820-30), after which time he returned to Calcutta where he served as Deputy Assay Master in the Calcutta Mint, 1832-38. Prinsep was a talented amateur artist and published Benares Illustrated in 1831. He was also a great scholar, interested in chemistry, mineralogy, meteorology, numismastics and antiquities.